The US Economy is close to experiencing the longest recovery in recent history. The record should be broken in July, surpassing the boom of 1991 – 2001 as the longest on record. So it is logical for economists to expect a recession soon. Nothing lasts forever. It’s a seasonal thing, we have periods of growth followed by periods of recession followed by periods of growth. While the general economy has so far avoided the R-word, Real Estate has experienced a recession of its own . U.S. Economy Fundamentals Remain Strong—GDP up 2.6%, Consumption up 2.8%, Core CPI up 2.1%, Job Growth 1.7%. Home Prices grew at 2.2% YTY. However, CA home sales down 5.6% YTY. And the good news continued this week. US weekly jobless claims lowest since 1966. So with all this good news, why expect a recession? One omen of possible decline is explained by Dr. Mark Schniepp of the California Forecast. The treasury yield spread has inverted. However, this has an interesting bright side. As the treasury yield spread inverted, it has also caused mortgage interest rates to turn downward, and lower mortgage rates are positive for the housing market. Last week, mortgage interest rates posted the biggest drop in a decade, declining 0.5%. There is plenty to be cautious about, and there is plenty to be pleased about. We start our look at the economy with what is going on in the United States, then drill down to the state of California, and finally how it may affect us locally. Locally, we have two very divergent valleys. 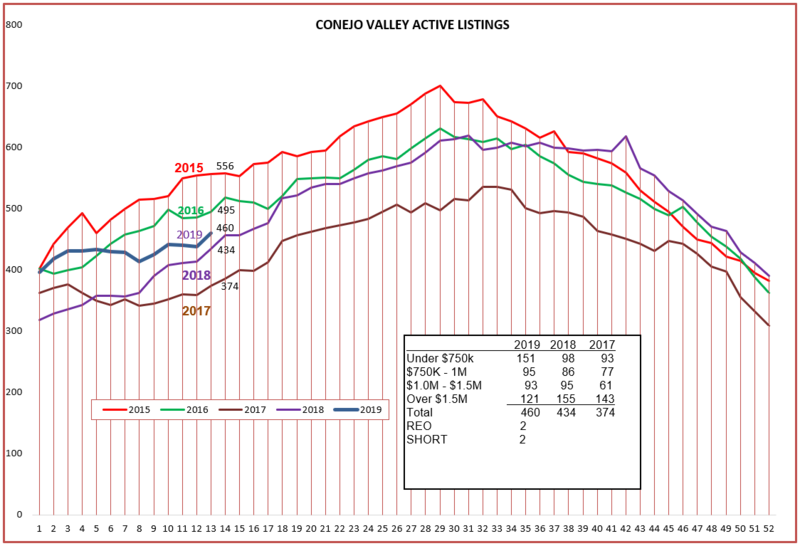 Conejo Valley Inventory is up 6%. 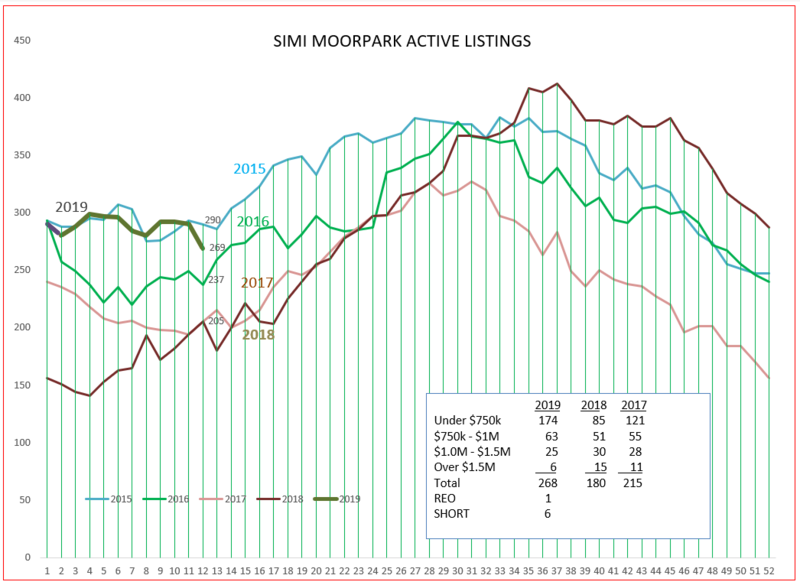 Simi/Moorpark inventory is up 49% from the same period last year. 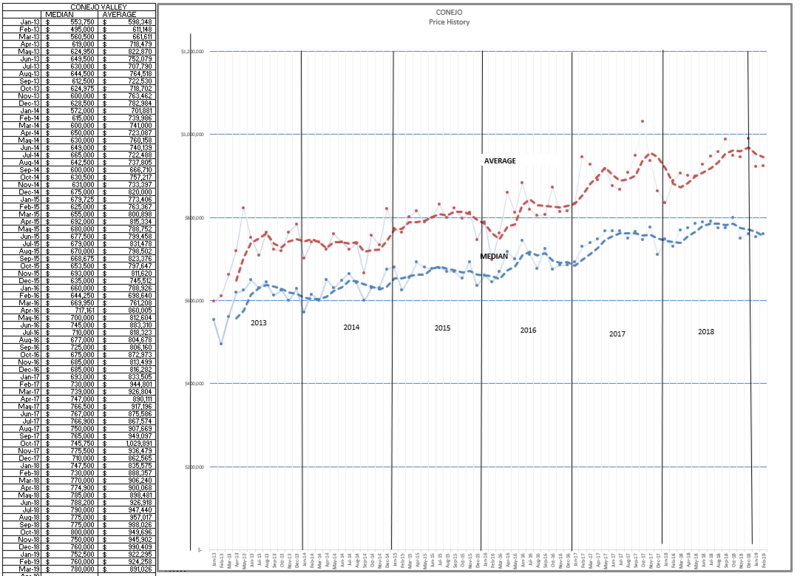 Conejo median prices are up 2%, Simi/Moorpark are up 4%. Conejo number of sales (3 months) are down 9%, Simi/Moorpark are up 5%. Conejo Valley has 3.3 months worth of inventory, Simi/Moorpark has 2.1 months. 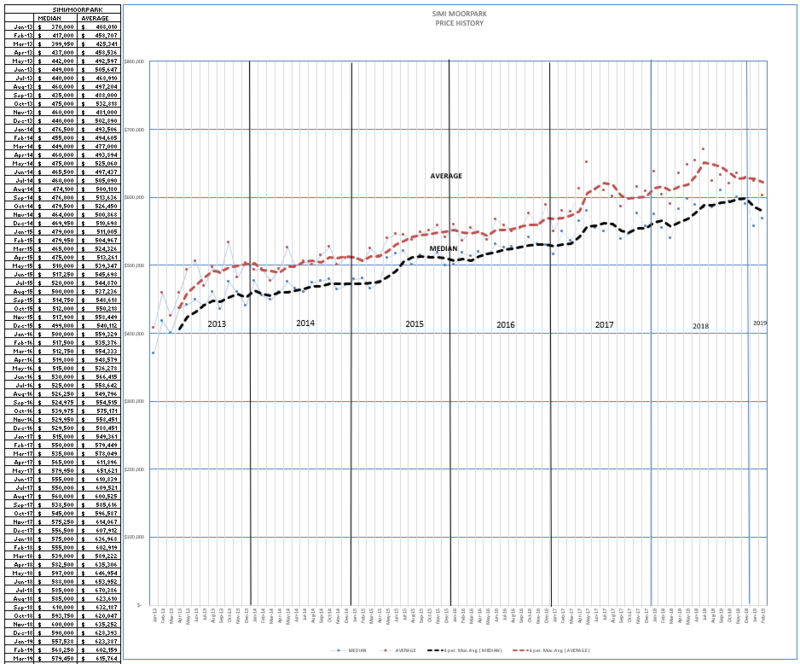 To see the next comparison, let’s look at the closed escrow charts for each valley. Let’s compare the number of March closed escrows. For Conejo, there were only 165 closed escrows compared to 215 last year, a drop of 23%. 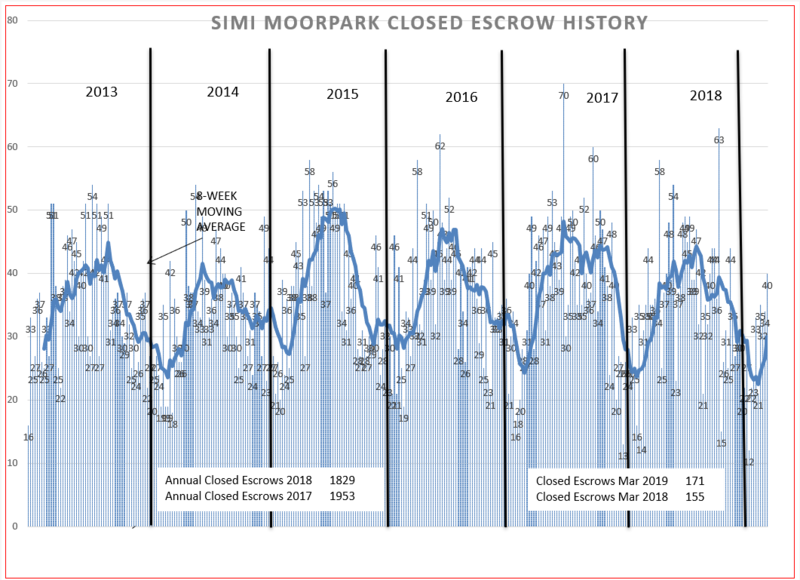 For Simi/Moorpark, there were 171 closed escrows compared to 155 last year, an increase of 10%. 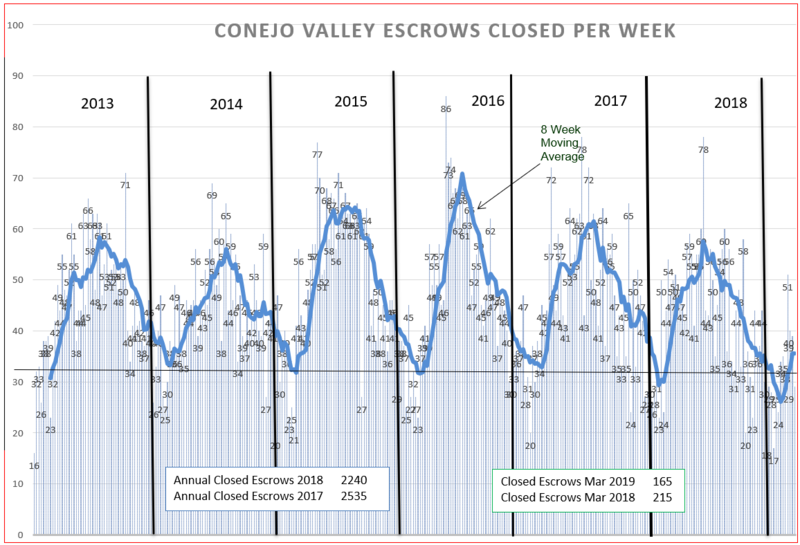 For the first time I can remember, the number of closed escrows in Simi/Moorpark actually beat the number of closed escrows in the Conejo Valley. The Conejo Valley is cold, Simi/Moorpark is hot. What does this tell us? Buyers are dealing with the affordability problem by buying homes they can afford, The statistical difference between Conejo and Simi/Moorpark can be understood by looking at the median price of homes sold, $765,000 in Conejo and $555,000 in Simi/Moorpark. The relationship between supply and demand and price still holds true. Both valleys are experiencing their seasonal dips in pricing. Thanks to the significant drop in mortgage rates, we should expect sales to pick up and prices to increase based on increased activity. Finally, the inventory picture. Conejo inventory has begun to increase as expected this time of the year after starting out with no growth at all. 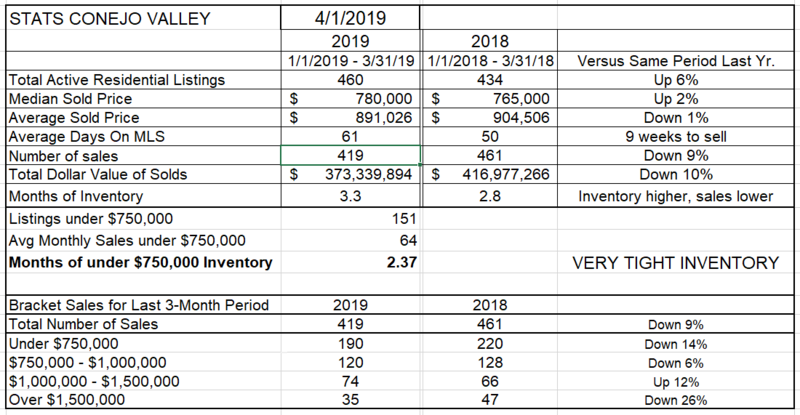 Simi/Moorpark inventory growth has mirrored the previous four years with the exception of 2018. All those years saw very anemic inventory growth to begin the year. Call this normal for Simi/Moorpark, but very different from Conejo. 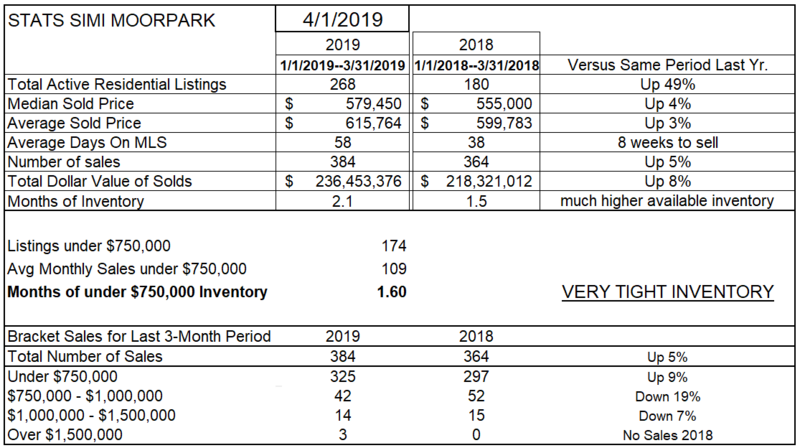 Comparatively lower pricing have helped the Simi/Moorpark market become very strong to begin the year, whereas Conejo sales numbers are being dragged downward by higher priced inventory. The market, and the overall economy, appears healthy. The problem is affordability. Mortgage rates have again dropped to very attractive levels. There is a reasonable amount of inventory available for sale. The market appears balanced between buyers and sellers. Home prices remain stable, rising with inflation. Advise your clients that it is a great time to buy the home they want to spend the next 10 years living in.